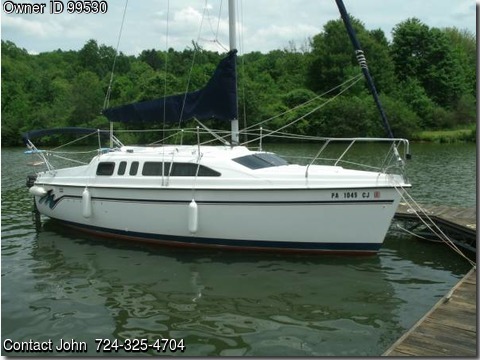 Boat is located in Prospect,Pennsylvania.Please contact the owner @ 724-325-4704 or jnovotnyp@aol.com…This Hunter 26 water ballast boat is a great boat to trailer. Mast raising system makes it easy to be up and ready. Shallow draft/trailerable aspect of the boat means you can launch, retrieve and sail anywhere. Cabin space below is enough for a family to day sail or weekend cruise. This boat is solid, safe and easy to manage. Trailer – all steel sections have been primed and repainted. Draft board up 1.75 ft. Draft board down 6.00 ft.
Mast Height over water 40.33 ft.